SMTP, POP3, IMAP4 and LDAP - Receive mail, send mail and access your accounts using any standard mail protocol. WebMail - Multi-lanugage access to your emails from any web browser using customizable templates. 256-bit SSL - Secure access to your mail with 256-bit SSL encryption. SPAM Protection - Prevent SPAM with RBL filters, self learning Bayesian Filtering technology, Grey Listing, SPF checking and much more. Antivirus Protection - Protect users from viruses by integrating your mail server with almost any existing antivirus product. 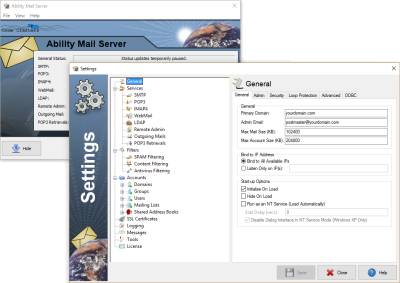 Strong Security - Lock down your mail server with IP Restrictions, SMTP Authentication, Tarpitting, Anti-hammering and more. Content Filtering - Set up rules to control your mail content, run applications, send new mail and much more. POP3 Retrievals - Automatically download mails from other mail servers into local accounts. Mailing Lists - Send bulk mails to multiple email addresses and accounts. Opt-in Mailing Lists allow users to automatically add and remove themselves. ODBC - Store and control vital user information using an ODBC database. Integrate your mail server with other applications and web scripts. Remote Admin - Remotely access your settings, user accounts and logs via any web browser. Domain Administrators - Allow users to administer their own domains through WebMail. 256-bit SSL / TLS - Use strong encryption to protect your data. Strong Security - Many security features help protect your accounts and data. Remote Admin - Full administration from any location. 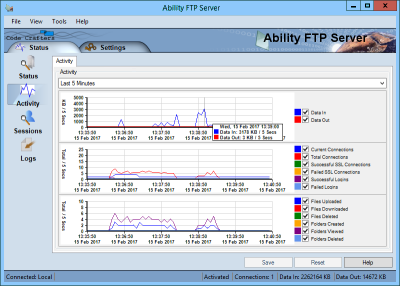 Session Viewer - View current and past connections with real-time 'Disconnect User' and 'Stop Transfer' options. Activity Viewer - View detailed graphs of connection counts, data flow, logins, file actions and more. Groups - Quick and fast account management with powerful group controls. Access Rights - Full independent access control for each account, group and virtual folder. Virtual Folders - Share folders amongst accounts and groups with individual permissions and quotas. Powerful Restrictions - Control disk quotas, IP access, allowed file types, transfer speed / throttle and much more. Message Control - Edit welcome messages and other server responses. Disk Quotas - Set a maximum space allocation for each account and virtual folder. Unlimited File Size Support - Full support for files of any size. Resumable Uploads and Downloads - Full support for resuming broken file transfers. Remote File Execution - Allow users to run executables on the server. RFC 959 Compliant - Compatible with all standard FTP clients.